Miles Supply is proud to offer a variety of diamond blades to cut all Bluestone. You tell us the parameters you want to run the machine, and we’ll match you up with the right blade at the right price. Our customers are telling us that these also work great on Granite, Limestone and Sandstone. This ‘W’ segment blade is the best of both worlds, with fantastic life and unheard of speed. The blade featured in the above video is near end of its life yet still cuts like new and has had approximately 3-4 weeks of 8 hour days on it! 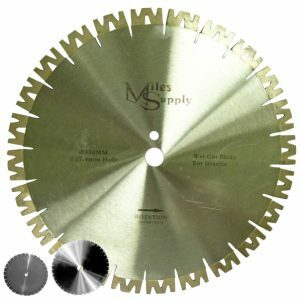 Stone Quality is also good, this blade does not snap corners or flex even at the speeds featured. The segment is designed with a W shape to optimize the cutting surface. The segment measures almost an inch tall; on a silent 18″ normally sized core it makes it 19″ tip to tip! We also carry a shorter segment blade if clearance issues are a concern on your recut table. They come in sizes 14″-26″ in silent and standard cores.